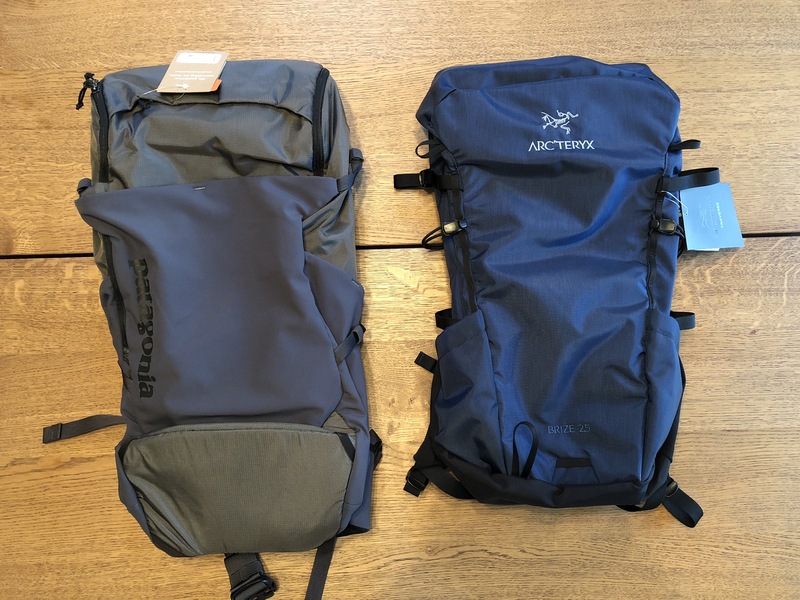 Towards the end of last year, I jumped on the Kickstarter bandwagon for a new backpack. They blew their goal away, and it turned out to be a really professional release that went smoothly, and delivered on time. Major kudos to the folks at Peak Design. I had previously been using a free backpack that was one of the swag items we gave away to some of our VIP clients, but wanted something a bit bigger, and more comfortable. The 20L version of the Everyday Backpack has thus far proven to be exactly that, and much more. Peeking in the top opening. Side view, with side panel unzipped. I stuff a bunch of cables into a divider-section. Other side view. Note different configuration to create a larger space on this side. Light fleece attached on the outside using the external load straps. Represent! WordPress pins attached to the should straps. I find that the shoulder straps self-adjust/slide out of position on their own sometimes. So basically I’ll put the backpack on, and find that I need to tighten the shoulder straps (pull down on the ends). Not a big deal at all, but a minor annoyance on an otherwise pretty flawless bag. Perhaps because of how I’m using the dividers, I find myself opening side pockets constantly to get things out. Again, not a big deal, and to be honest, I could probably reduce this by re-organizing the interior a bit, but the reality is that the side pockets are marginally awkward to get into once you put the bag down (e.g. you probably end up laying it flat on a desk or something to do it). There is a small reflector strip at the bottom/front of the bag, but it doesn’t seem to reflect all that well, so I don’t know how visible it makes you as a cyclist, for example. The side pockets are relatively small, so you can’t for example fit a full-sized Nalgene bottle in there, but this one from Miir fits pretty perfectly. With that out of the way, let’s move on to all the things I really like about it! I really like the size of the 20L. It’s just right to carry everything I could possibly want in a day, without giving me enough room to tote around a bunch of junk that I don’t need. The materials all seem really high quality, especially the custom hardware (clips etc). The fabric is a weird, futuristic-feeling stuff, and the waterproofing seems to work pretty well (already got snowed/melted on once). The external load straps are a great idea, and surprisingly useful. I’ve already used them a few times for carrying a jacket/sweater after needing it in the morning, and then finding myself too hot in the afternoon. I really love the shoulder straps, and their pivoting joint to the main bag. I find them perfectly comfortable, no matter how much weight I’ve put in the bag. All the magnets are such a subtly-stylish way of handling closures, and make this thing feel like it’s from the future. Side pockets, base/front panel, interior pocket. Fwap. At first I thought the top + side handles were overkill, but I’ve come to really appreciate them. They feel sturdy, and are easy to grab from any angle. The luggage pass-through has already proven really handy, especially when combined with the side pockets (one of which becomes the “top” pocket, when you have the backpack mounted on the handle of a piece of rolling luggage. I travel a fair bit, so it’s good to be able to keep things organized when on the move. The interior dividers are awesome! I thought they were kind of ridiculous when I was looking at the specs of the bag, and since I’m not a photographer I had assumed that I’d just pull them out and forget about them. Instead, I figured I’d give them a shot, and absolutely love them. They are the main form of organization for me within the bag, and I’ve tinkered around with flipping panels up/down, re-arranging them to create different sized compartments to suit different needs. Absolutely brilliant. I kept all the external load straps on there, although I’ve mainly used the bottom 2 so far. I have the key fob carry still attached (with the little disc on my keychain), but only really use it when I travel (normally my keys live in my pocket). I have the waist strap tucked into the side pockets, and don’t normally use it. Maybe if I find myself riding a bike a lot with the backpack (it’s winter, so that hasn’t happened yet), then I’ll use it more. I use the chest strap pretty regularly, since I walk a lot with the pack on, and that helps distribute things, and make it more comfortable. I’ll often carry a 13″ MacBook Pro, adaptor, 9.7″ iPad Pro in a keyboard case, a bunch of cables, and a few notebooks, plus a bunch of smaller things (plugs, memory cards, spare batteries, etc). Awesome manbag from Maxpedition. Single-shoulder carry, loads of space, and will work for concealed weapon carry as well if you’re into that kind of thing. Awesome backpack from 5.11 Tactical. Seems to be about the best all-rounder you can find. This was me, packed up and getting ready to make the hike back down to Bottcher’s Gap and then head home.